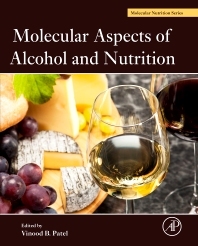 Molecular Aspects of Alcohol and Nutrition is a valuable resource for nutrition researchers and nutritionists who study or treat alcohol-related diseases. Experts from across the field of alcohol research explain how alcohol disrupts normal fat, carbohydrate, and protein metabolic processes occurring in the liver as well as other parts of the body. The book discusses how this can lead to alcoholic liver disease (ALD) as well as contribute to the onset of Type 2 diabetes and the metabolic syndrome. It also explores how alcohol affects nutrient absorption in the gastrointestinal tract and can lead to anemia and reduced amounts of fat soluble vitamins. This book explores both the primary and secondary consequences of alcohol consumption. Chapters in the first section investigate the basic science of alcohol metabolism – focusing on how alcohol and its toxic metabolites disrupt and impair normal nutrient regulation at the molecular level. Further chapters explore how alcohol affects many extra-hepatic organs and tissues as well as the secondary consequences of alcohol consumption such as reduced levels of minerals like magnesium, calcium, and trace elements like zinc.